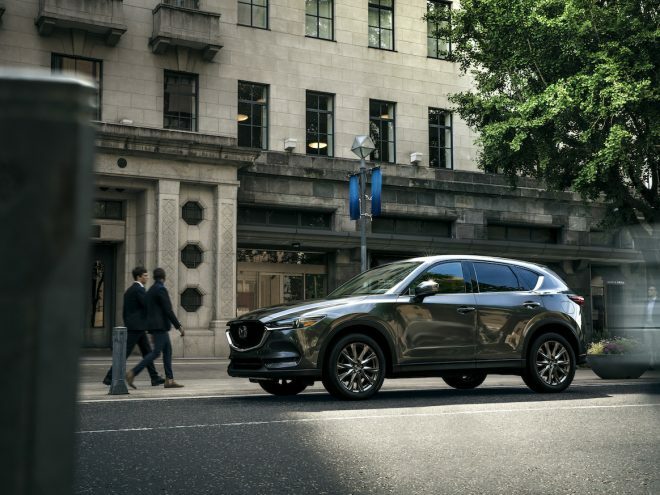 Mazda knows the crossover craze is in full effect; their CX-3, CX-5, and CX-9 are hot commodities these days. 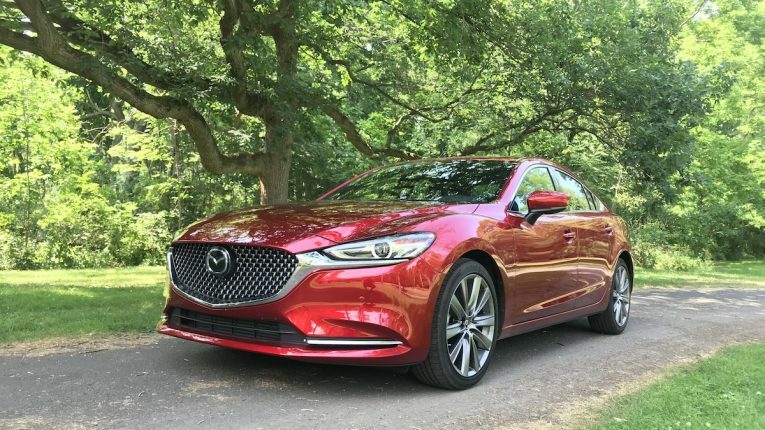 But the Mazda6 has always been a bright star in the Mazda portfolio, and in the midsize segment in general. 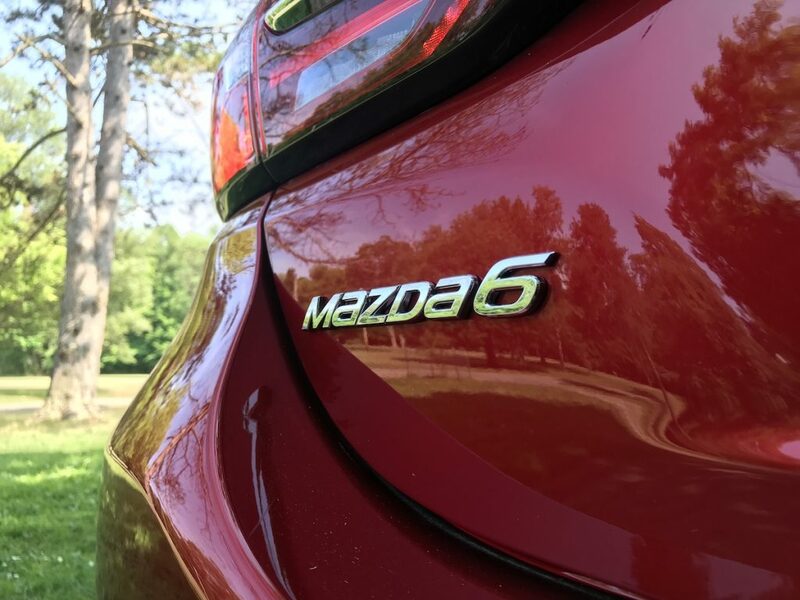 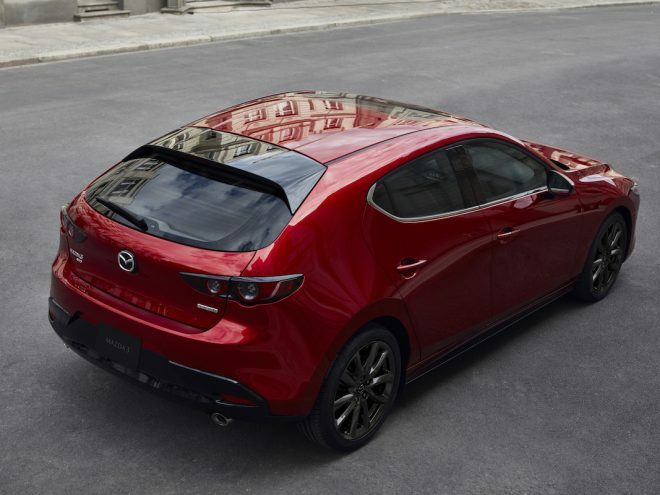 The engineers and product planners at Mazda have always been about putting the driving experience first. 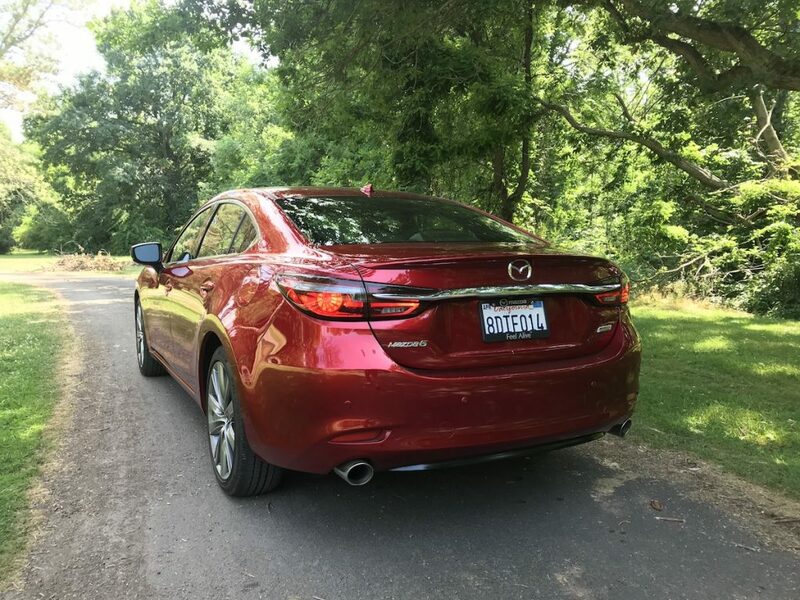 To them, cars are not simply a way to get from point A to B, but opportunities to enjoy journeys and experiences along the way; Mazda wants each drive to be memorable, enjoyable, and “a happening” for both driver and passengers alike. 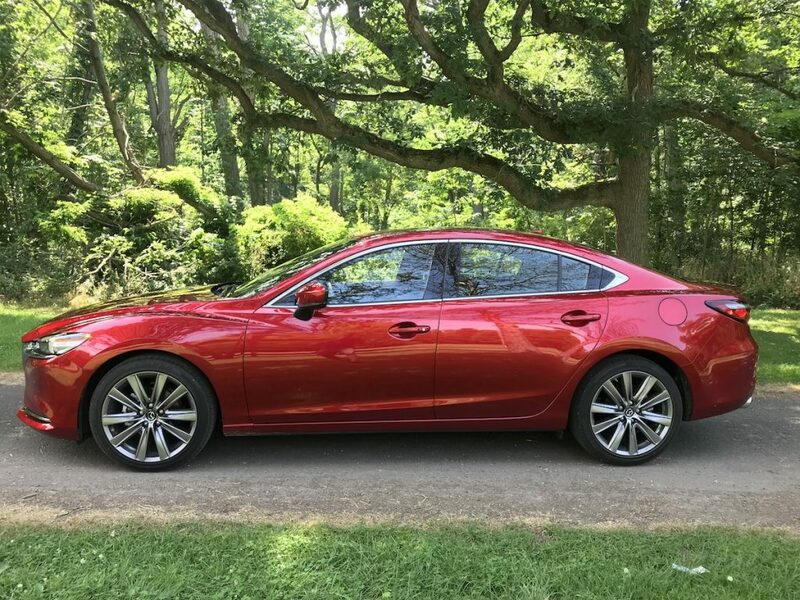 That’s why they went back to the Mazda6 and set out to refine it in all ways possible without totally retooling the plant that builds it. 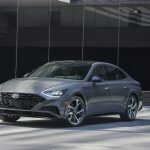 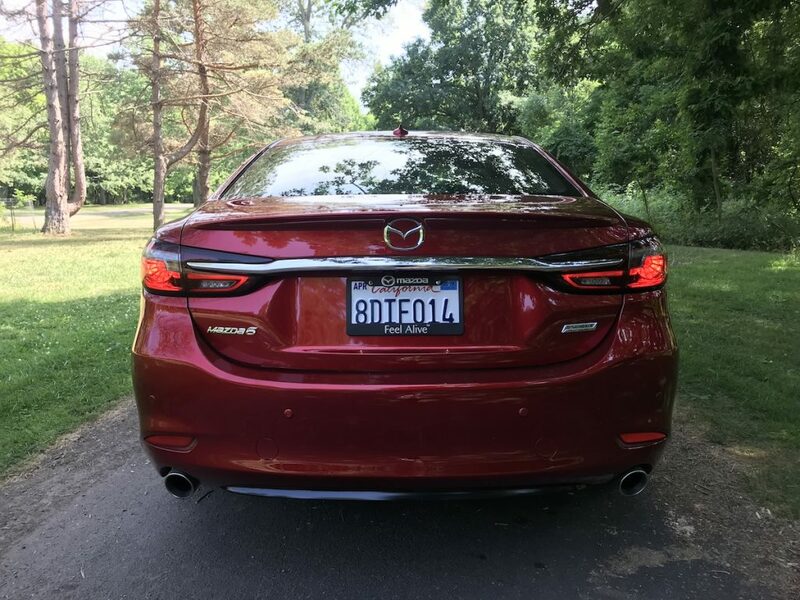 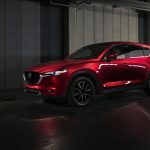 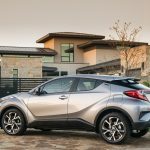 Mazda incorporated all the feedback of the owners, professionals that drive and write about cars for a living, as well as their own journeys as engineers and found ways to tweak and make incremental changes to details that an owner would appreciate. 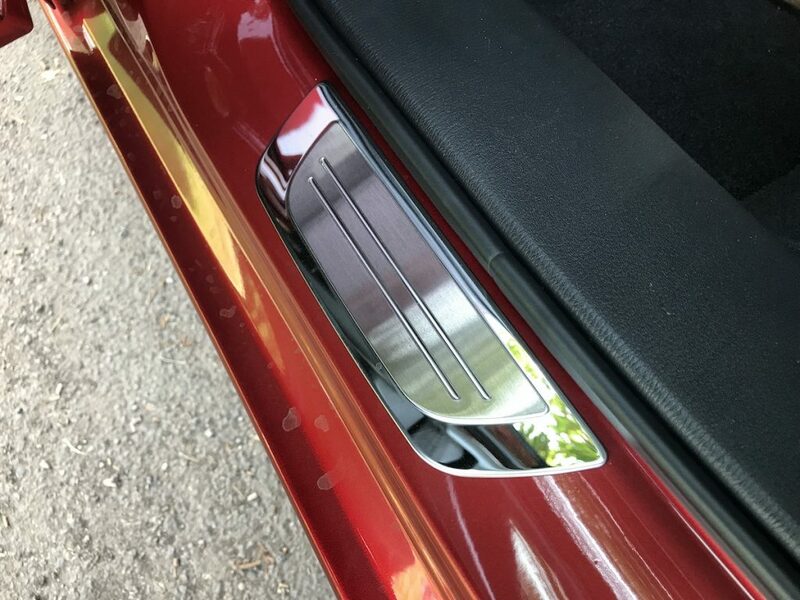 Starting on the outside, the Signature trim looks absolutely stunning in Soul Red Crystal metallic paint. 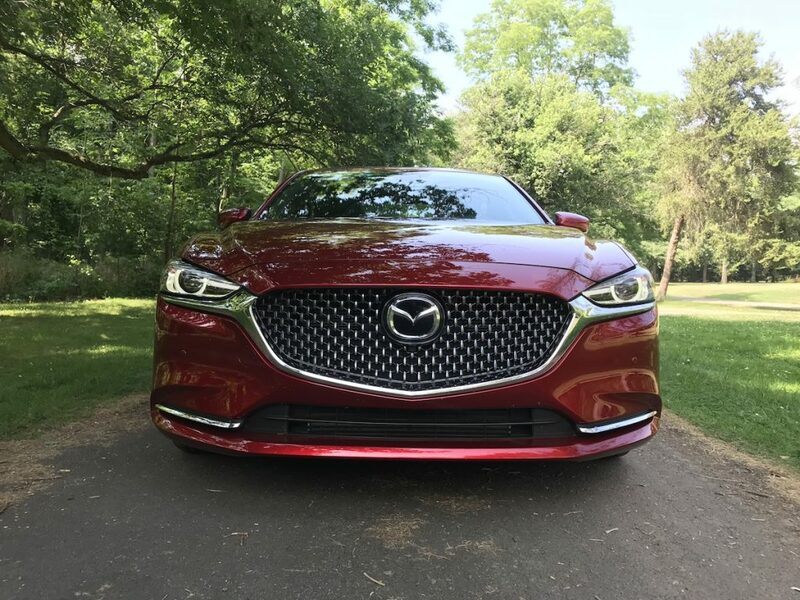 Heads turned everywhere we went, people stared, and we firmly believe this is the best looking Mazda, and one of the best looking sedans on the market. 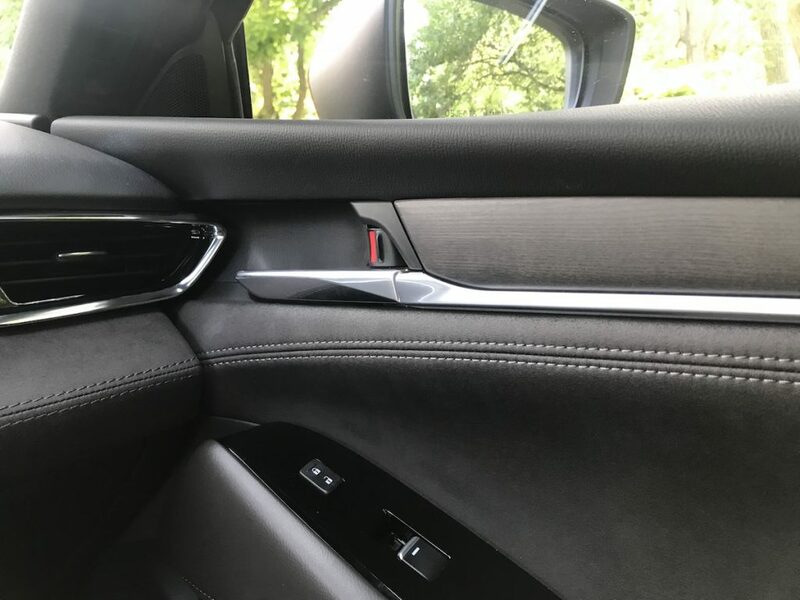 The proportions are perfect, the lines connect, and every surface has depth and dimensionality that can be easily seen with the seductive paint. 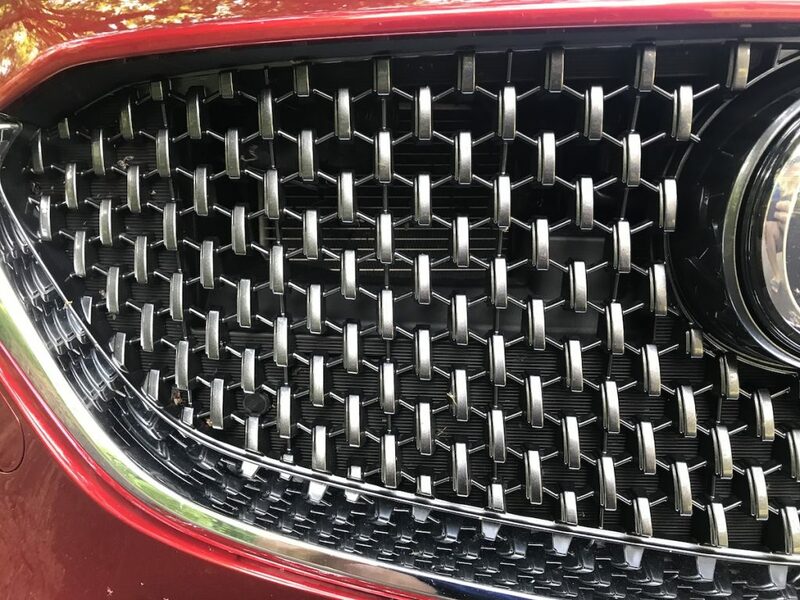 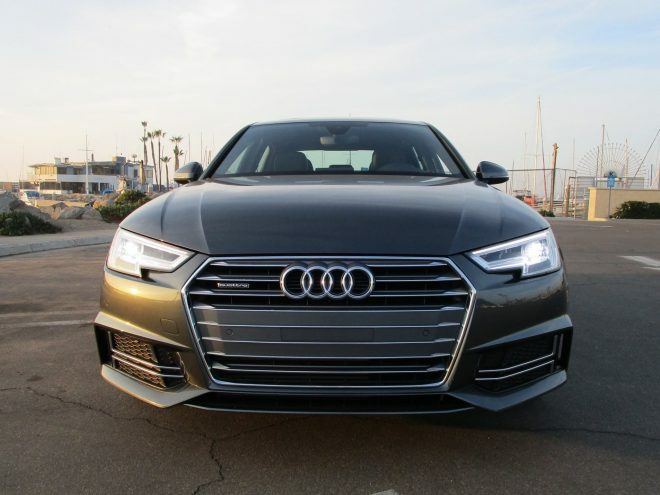 Chrome trim is used in all the right places and not excessively; the grille is a design study on its own. 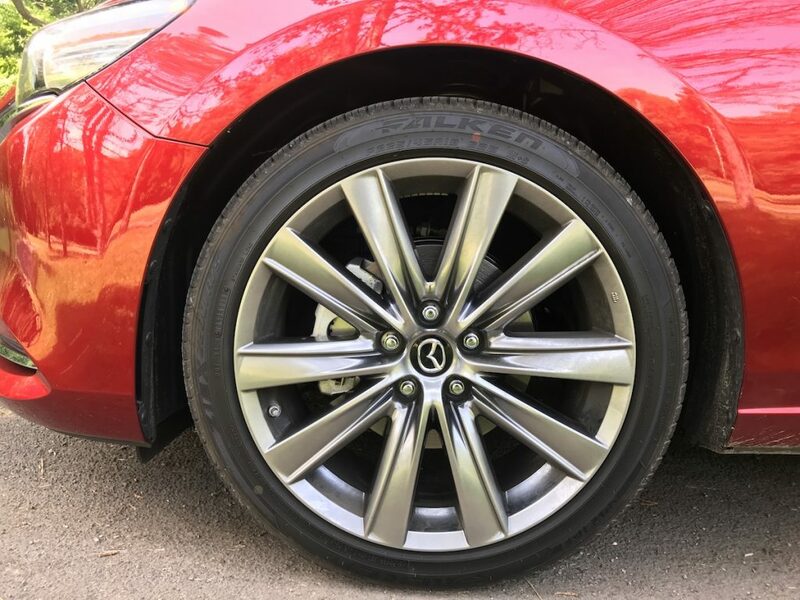 The stylish 19″ wheels fill the wheel wells and make the Mazda6 look planted, confident, and strong. 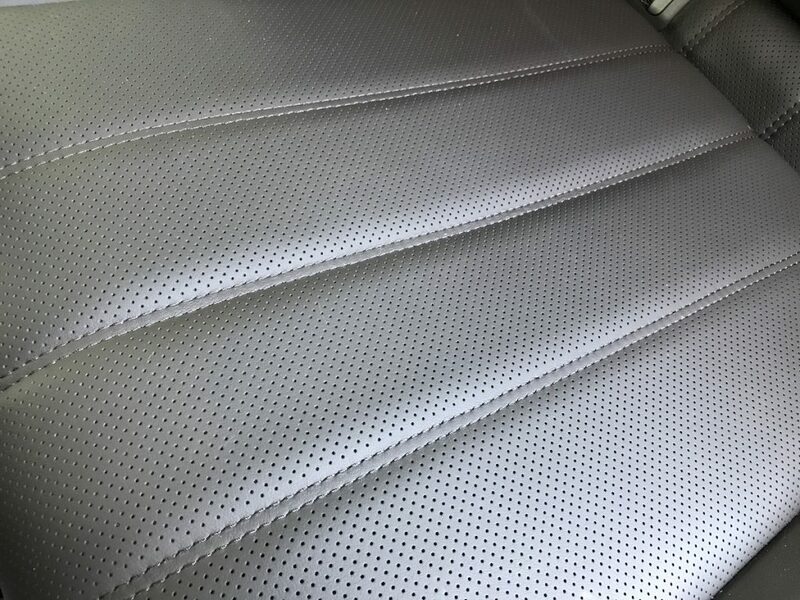 Unlike other vehicles, the thinner rubber doesn’t lead to any degradation in ride. 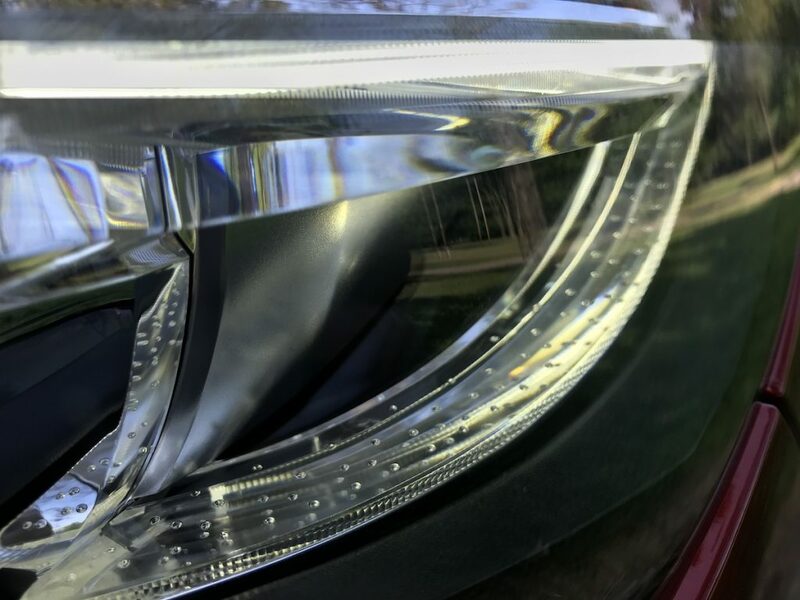 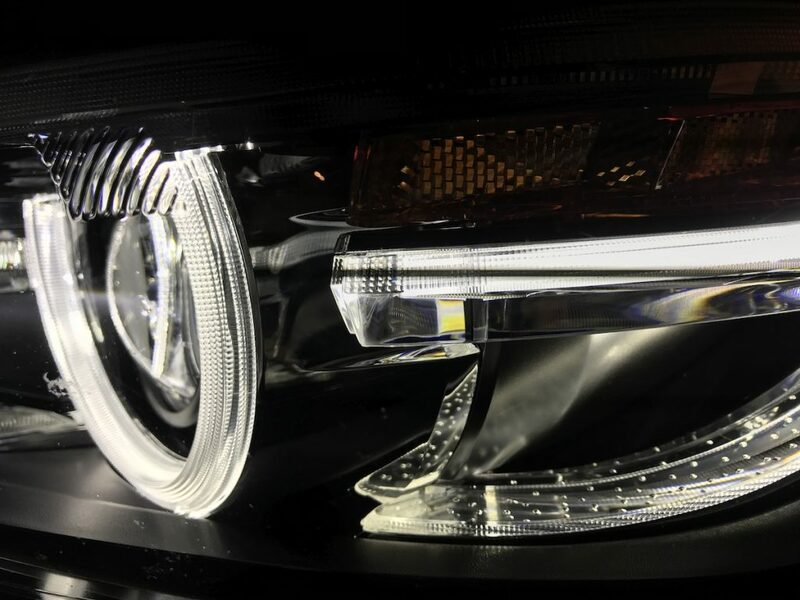 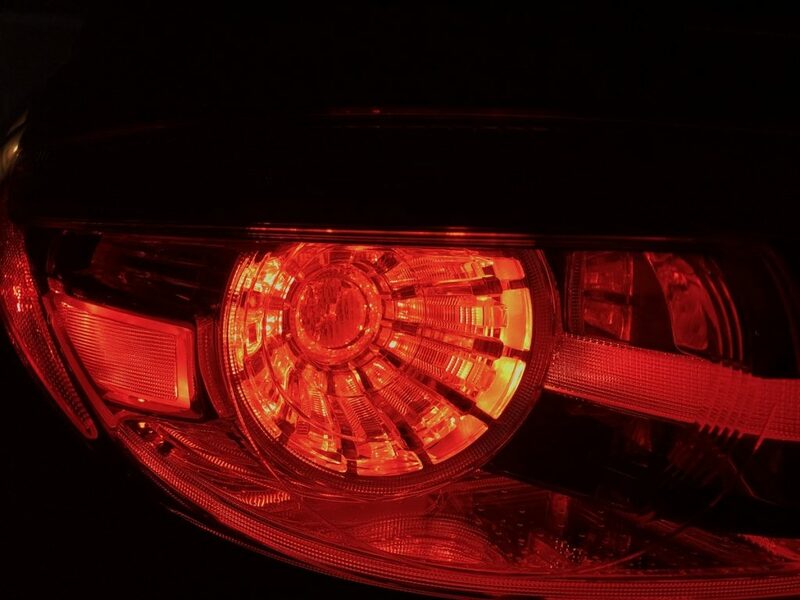 At night, adaptive LED headlights throw a broad, intense flood of light ahead, with automatic high beams pushing it even further. 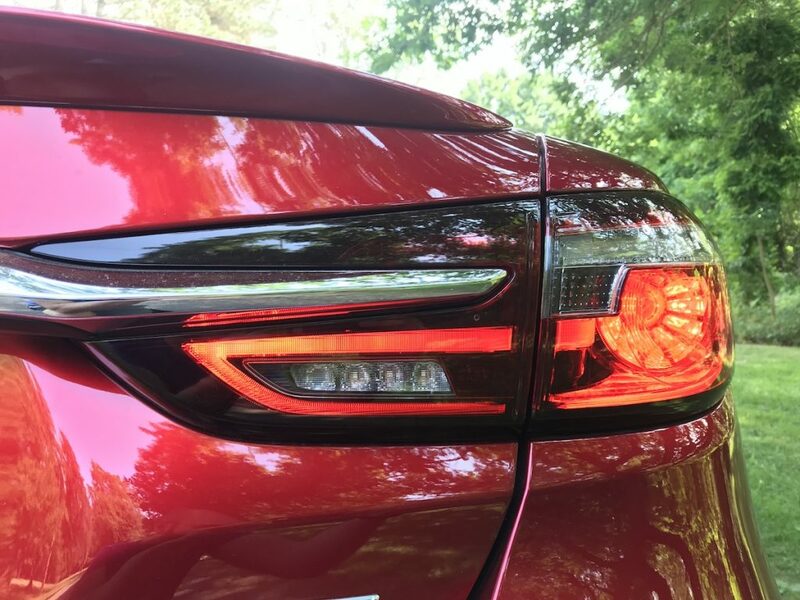 Every exterior light is LED and we’re pretty sure the same is true inside too. 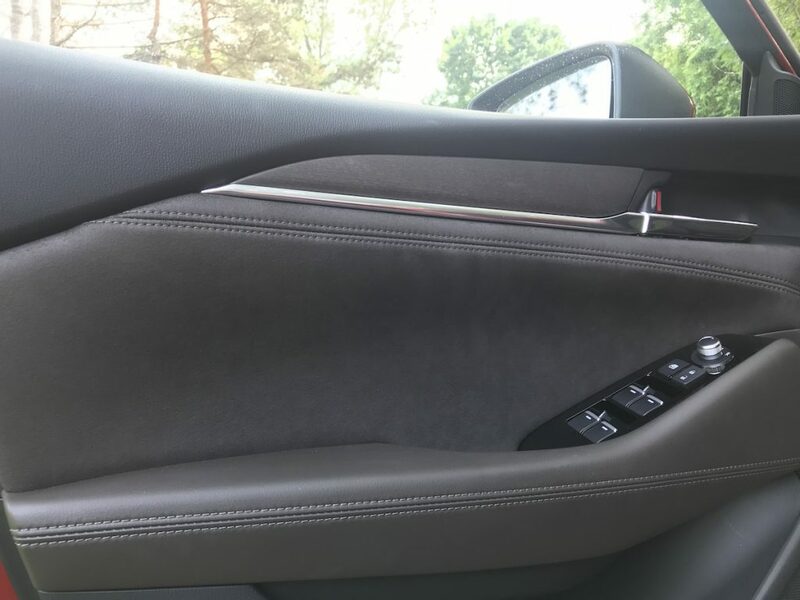 Opening the doors, a delicious whiff of high quality materials align with the visual senses of beauty within. 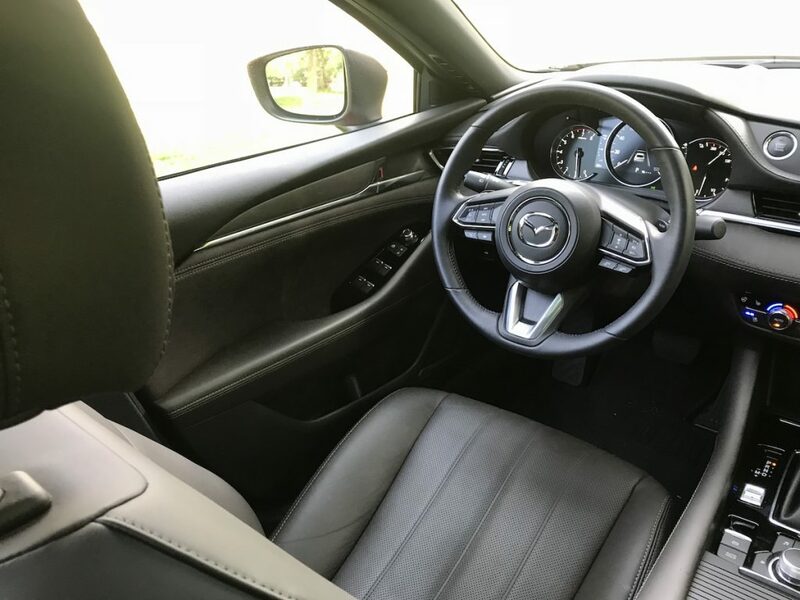 Deep Chestnut Nappa perforated leather, UltraSuede, Japanese Sen wood, and soft touch materials stitched beautifully together make the Mazda6 feel like a car costing three times as much. 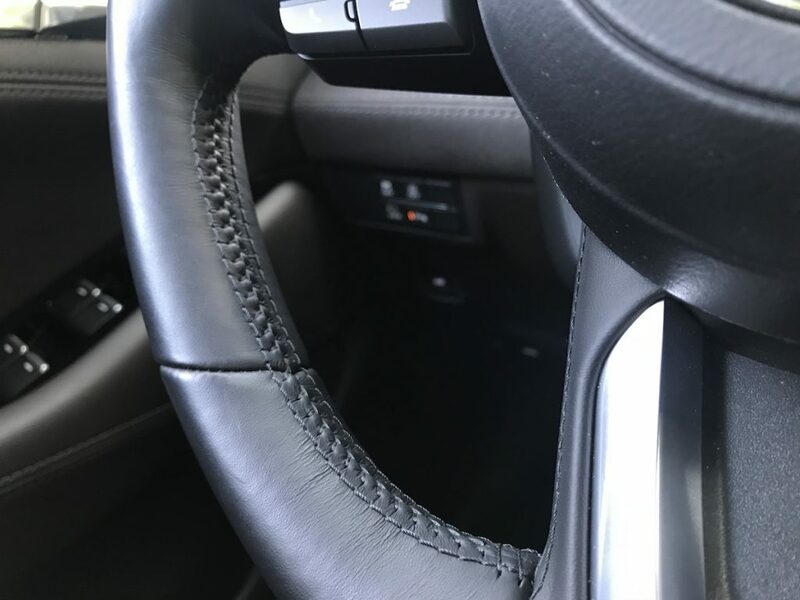 The steering wheel is a work of art, with intricate stitching, soft leather, and heating capability. 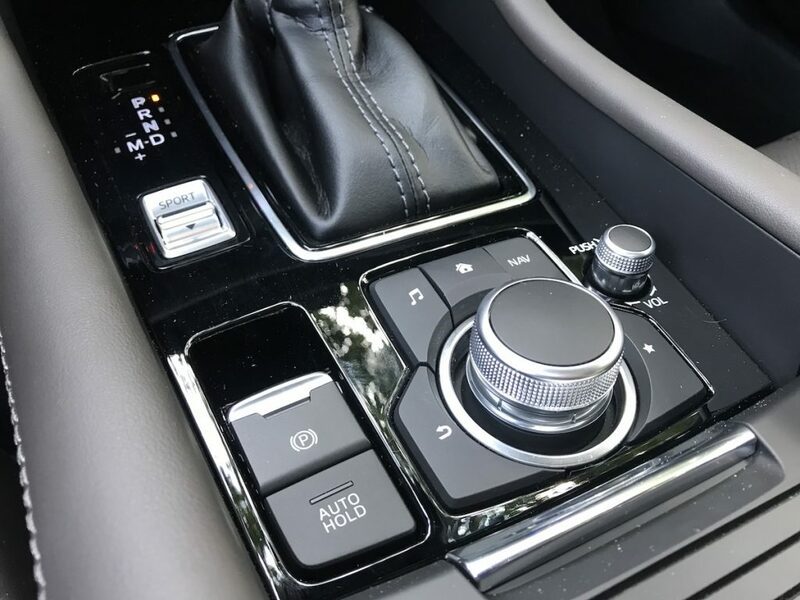 All controls have a solid and mechanical feeling, like very high quality equipment. 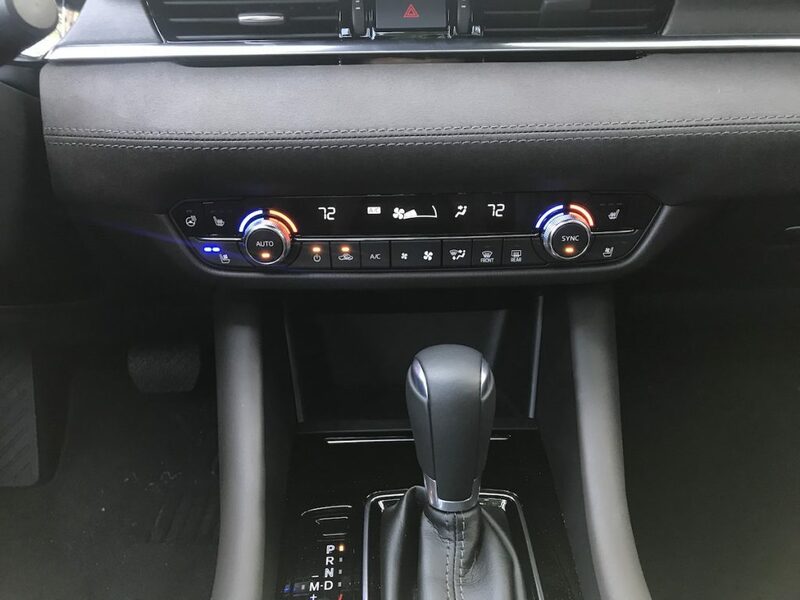 Seat adjustment controls and window switches feel like something that belongs in a car costing significantly more, and the knurled knobs on the dash turn with the fluidity of a precise micrometer. 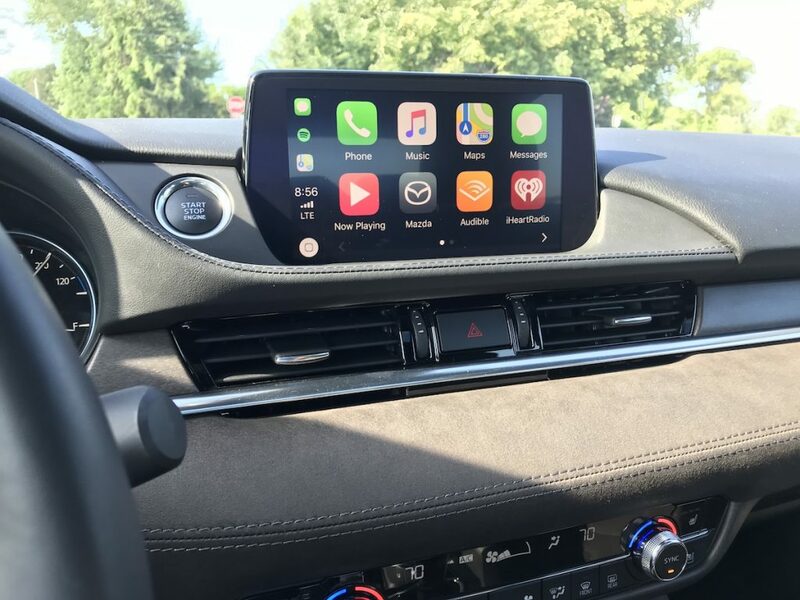 We’re so happy to finally see Apple CarPlay on a Mazda vehicle. 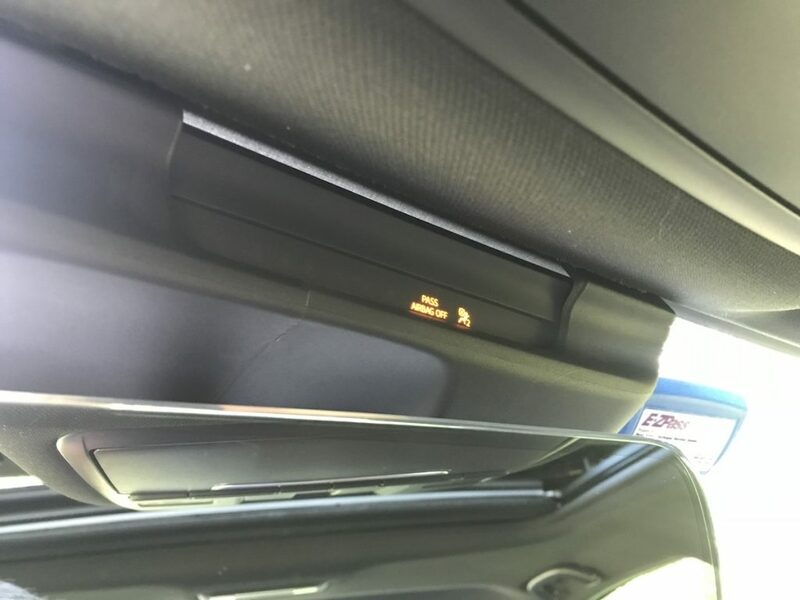 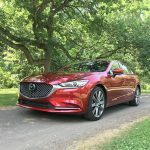 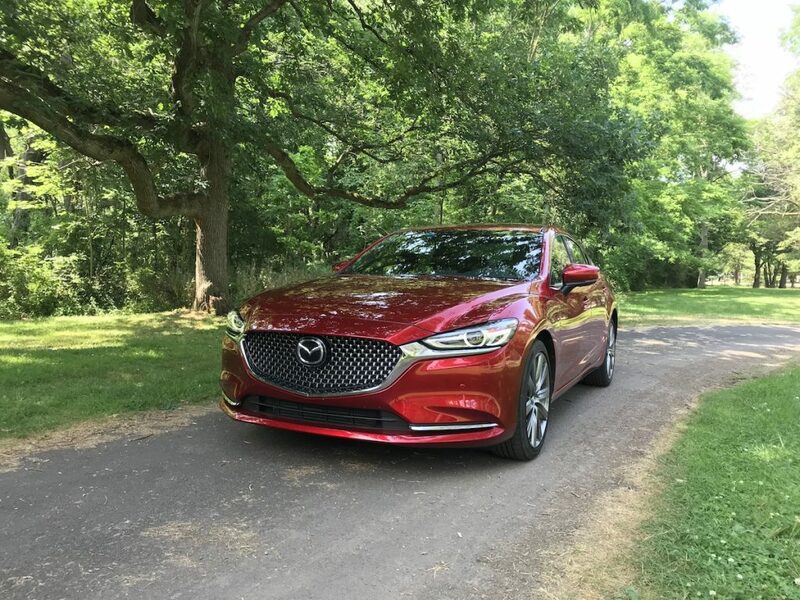 The 2018 Mazda6 is the first vehicle to receive the update, and we really like how easy it is to use. 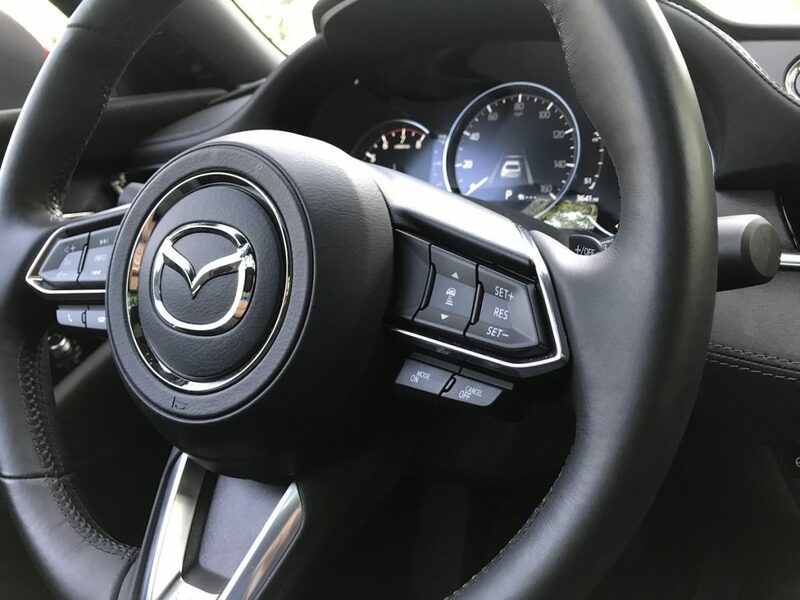 Mazda allows the system to be used via touchscreen or the controller knob when the car is parked, but only through the knob when moving. 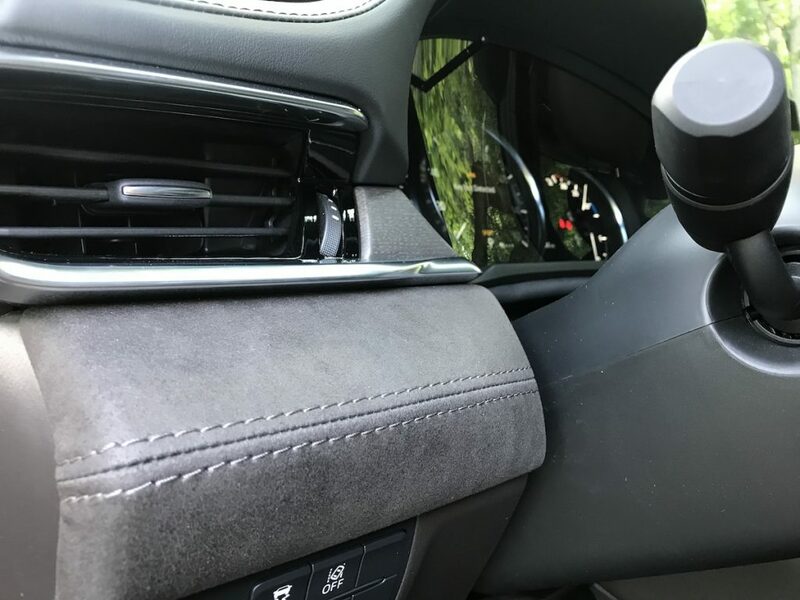 The 8″ screen is a good size, but a larger display would be even better. 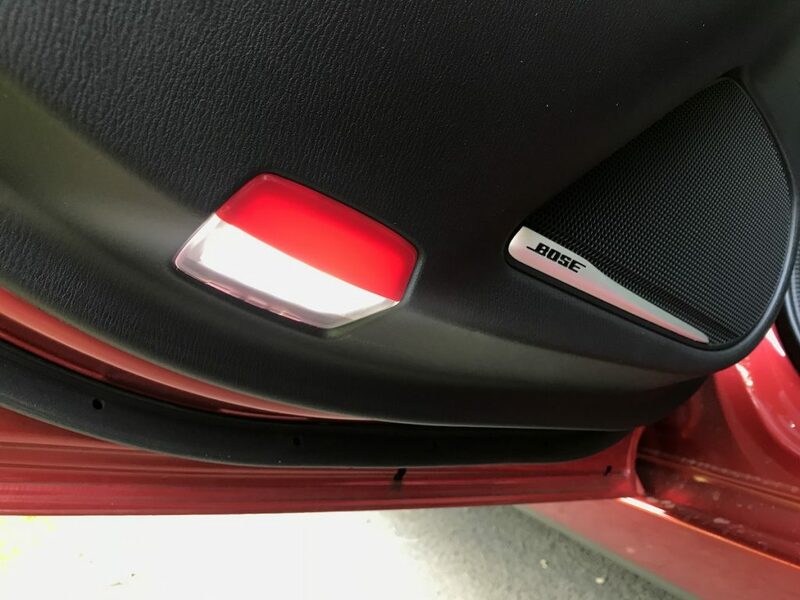 The Bose 11-speaker system sounds incredible, with lots of bass and clarity regardless of the music choice. 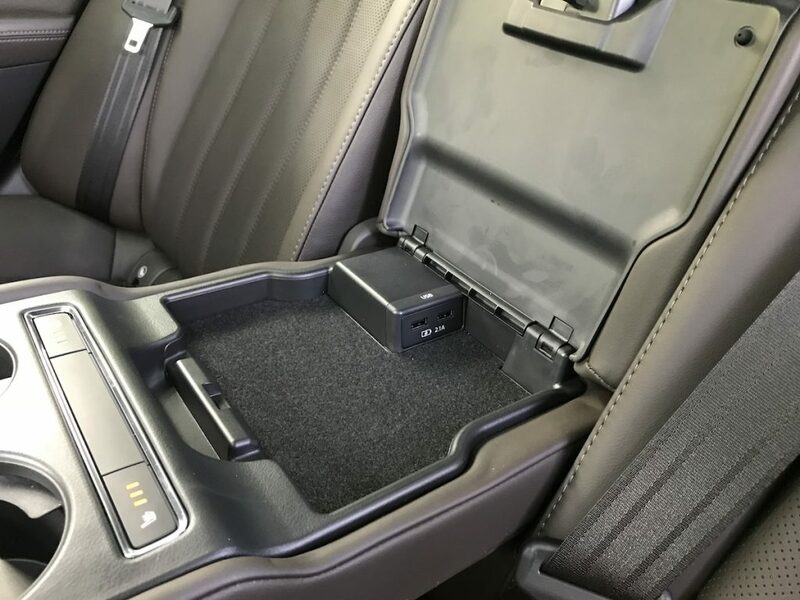 Music can be pumped in via bluetooth, radio, or USB. 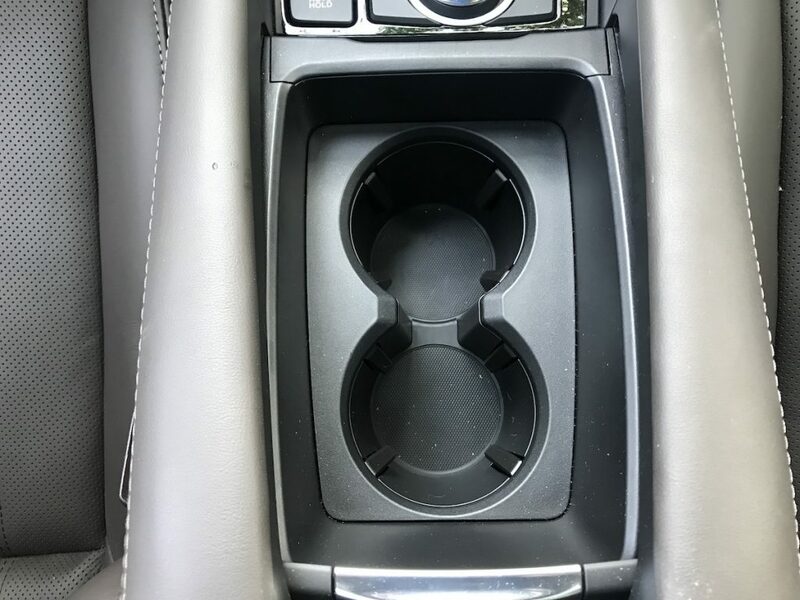 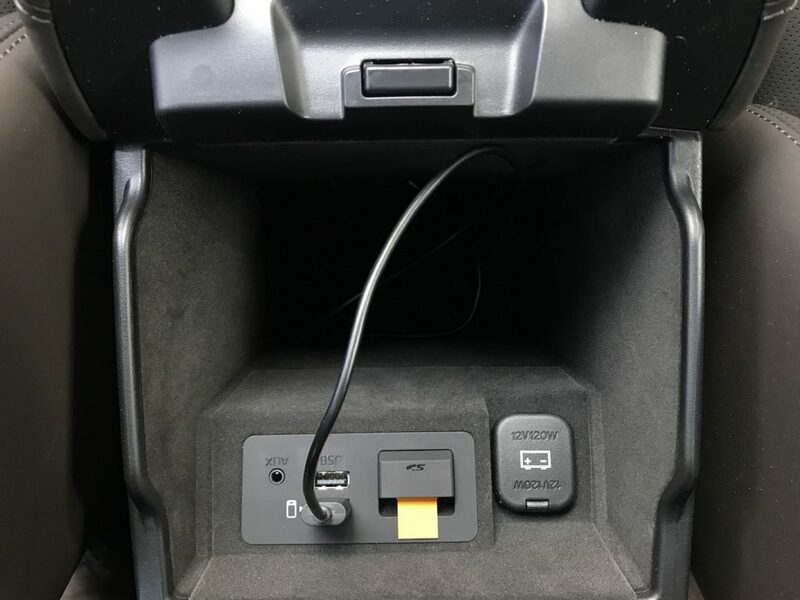 We have to tip our hates off to Mazda for including four USB ports. 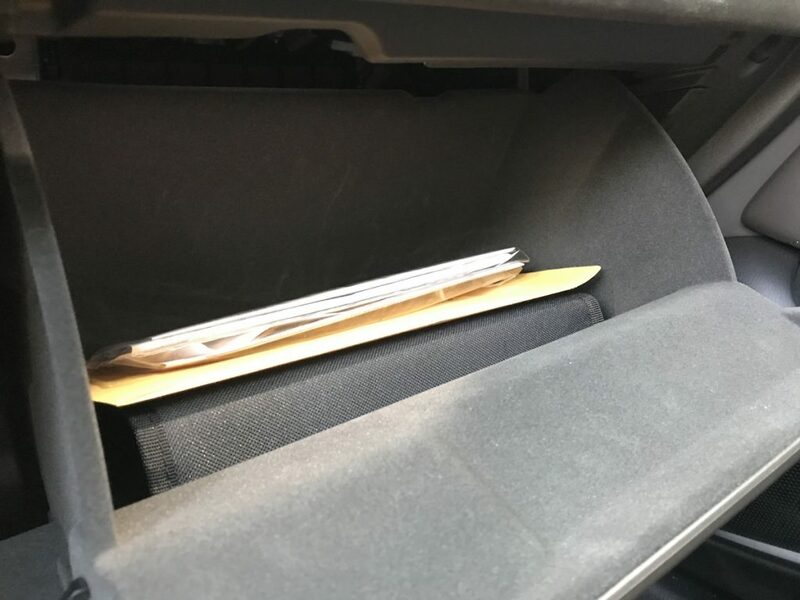 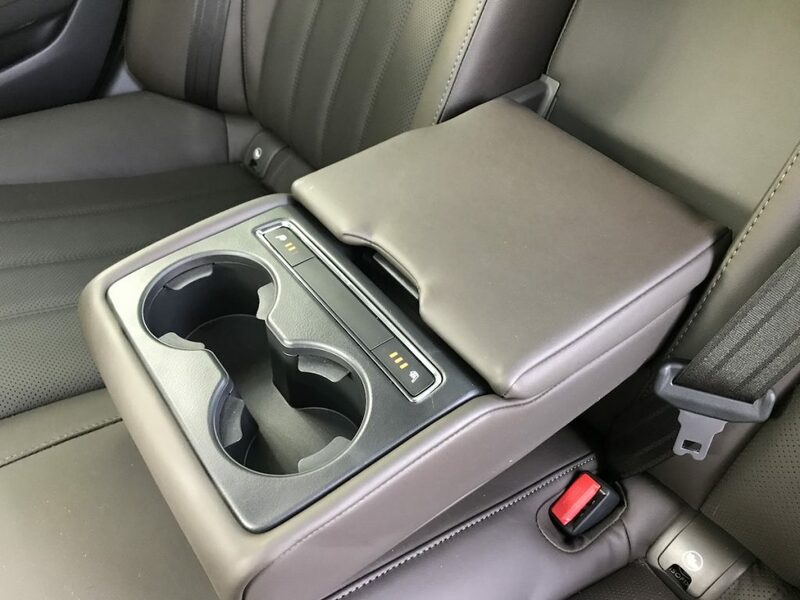 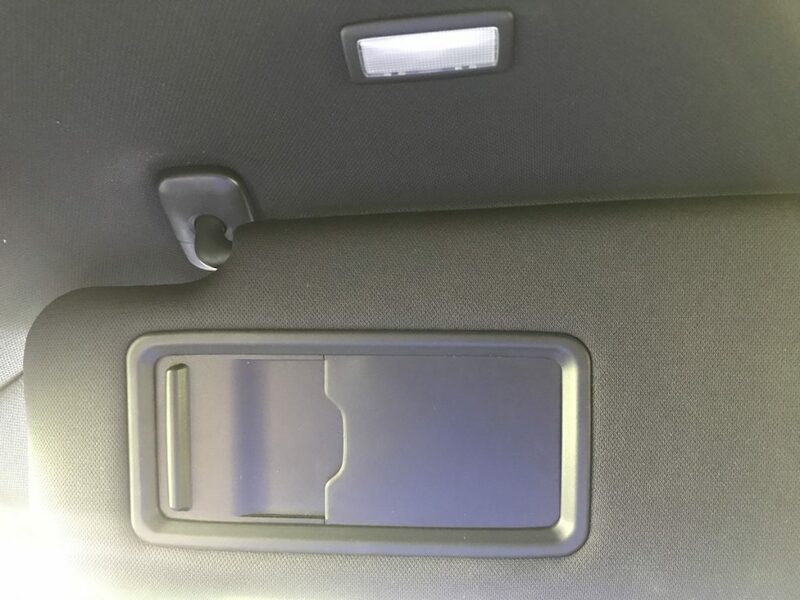 Two are in the front center console and two more are hidden inside the compartment within the rear fold-down armrest. 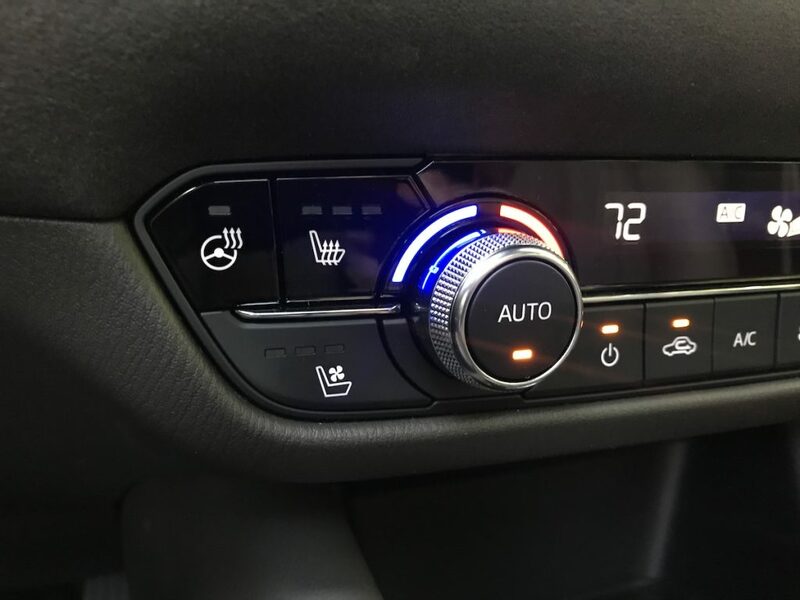 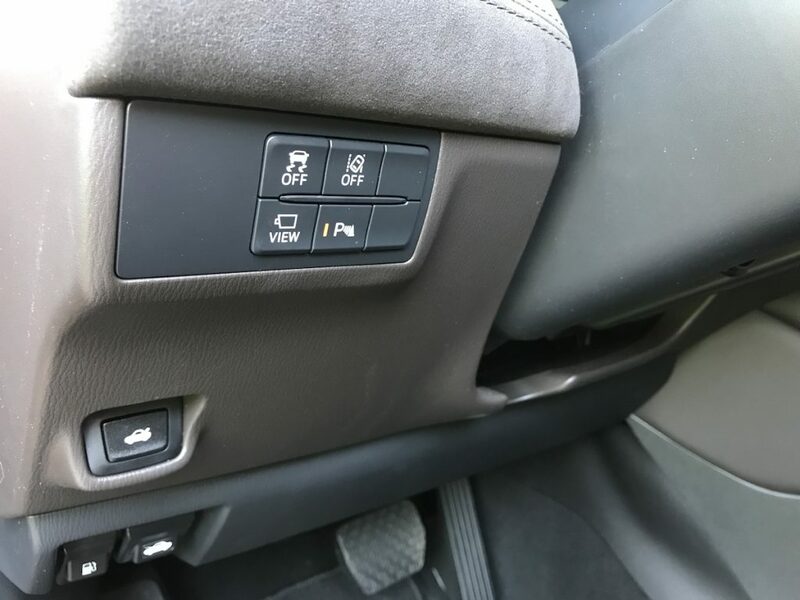 The armrest also features the three-level outboard heated seat buttons. 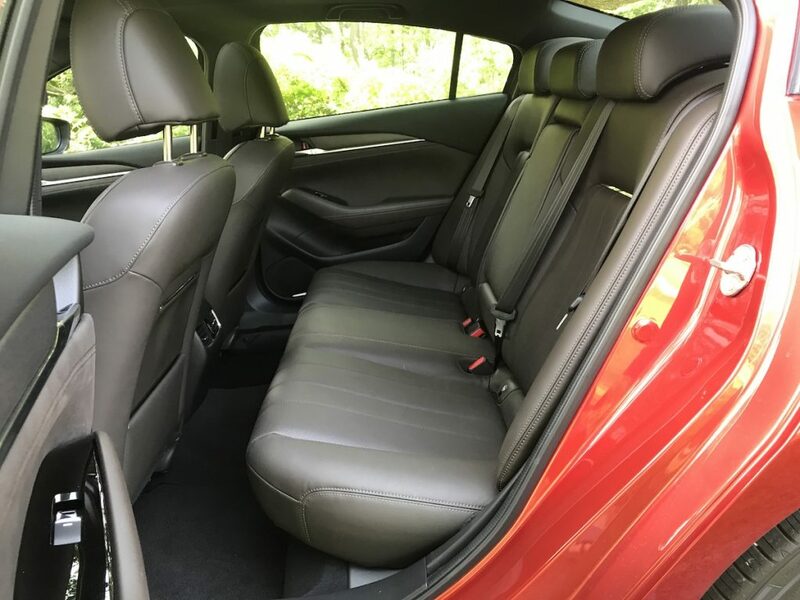 Legroom front and rear is excellent, with good headroom for a six-foot adult in any seating location. 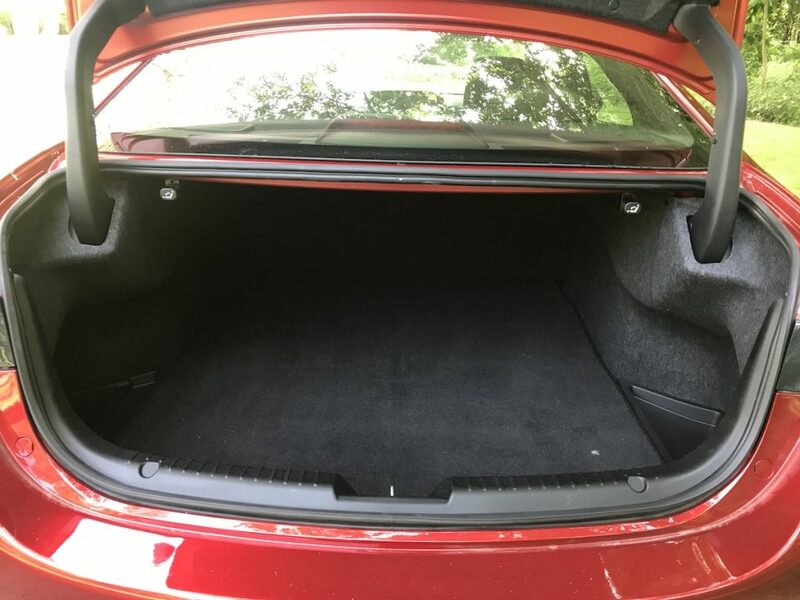 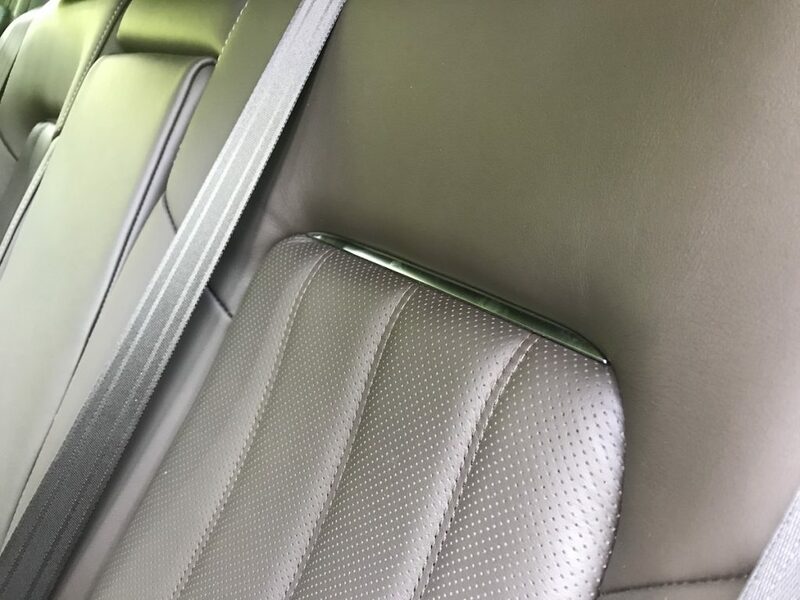 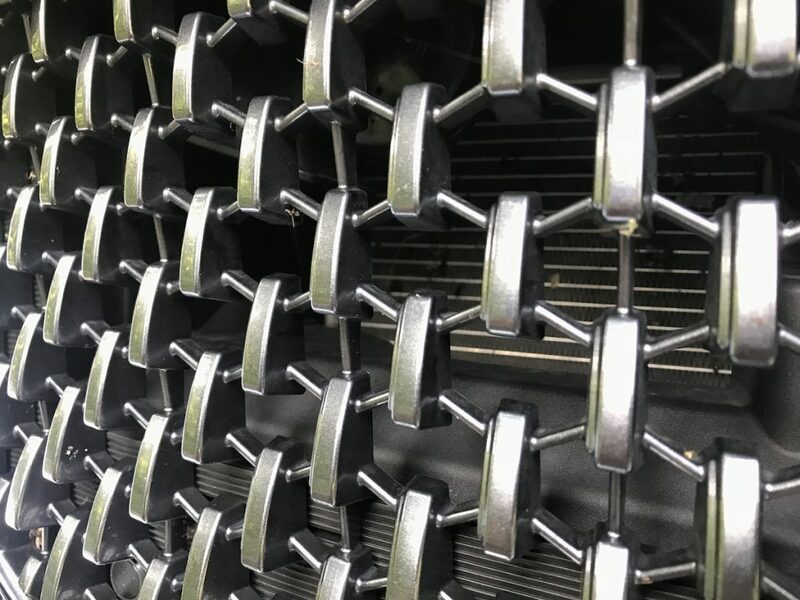 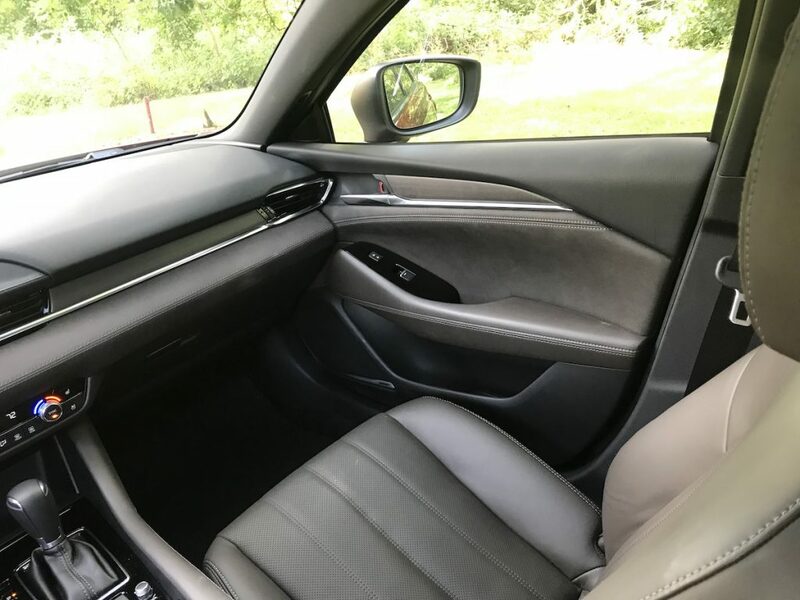 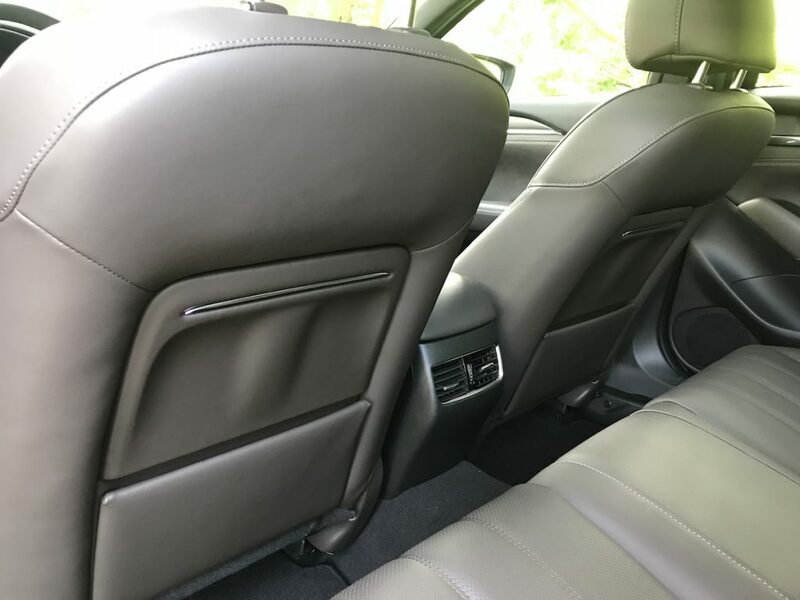 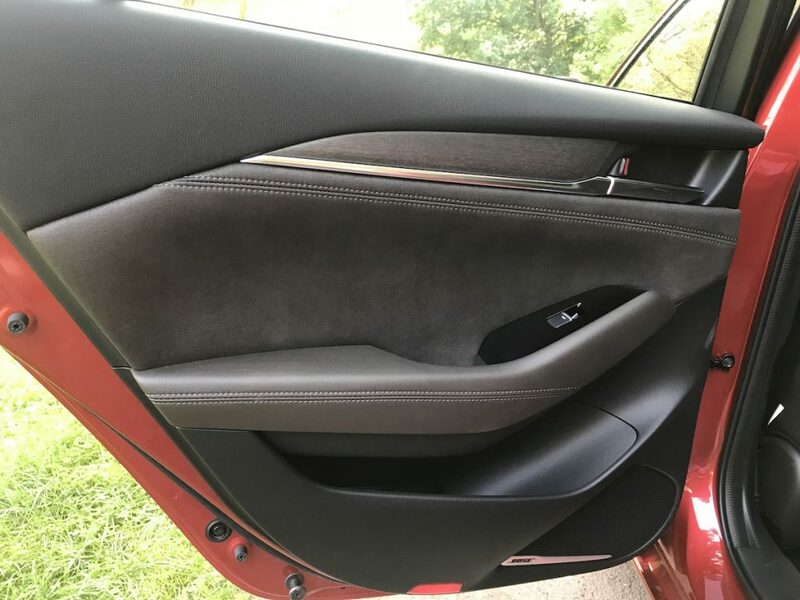 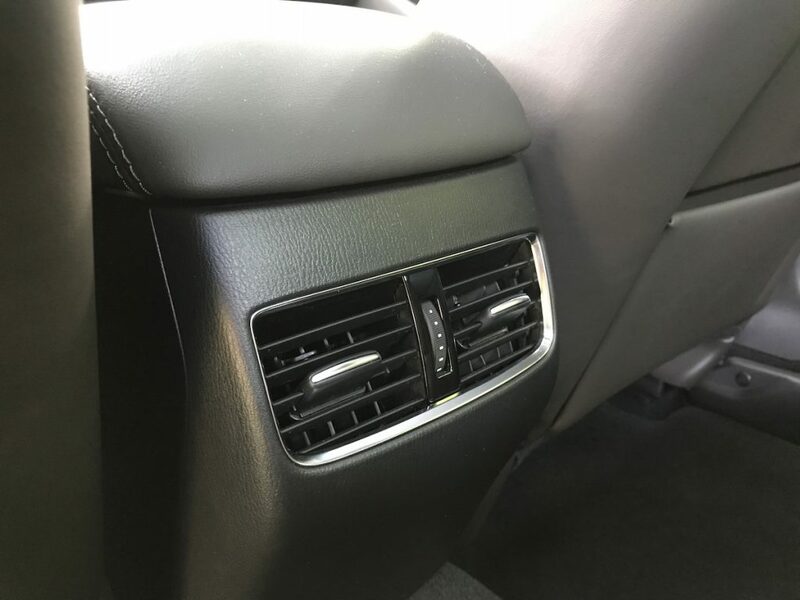 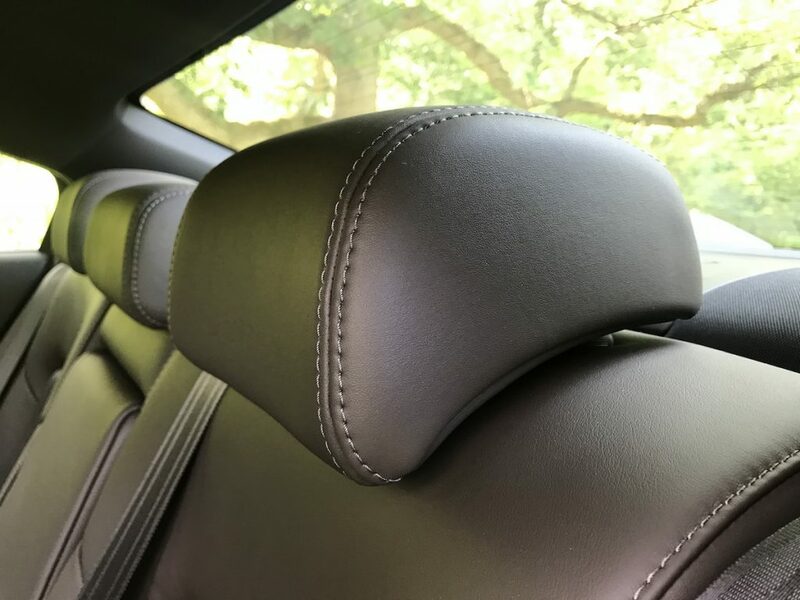 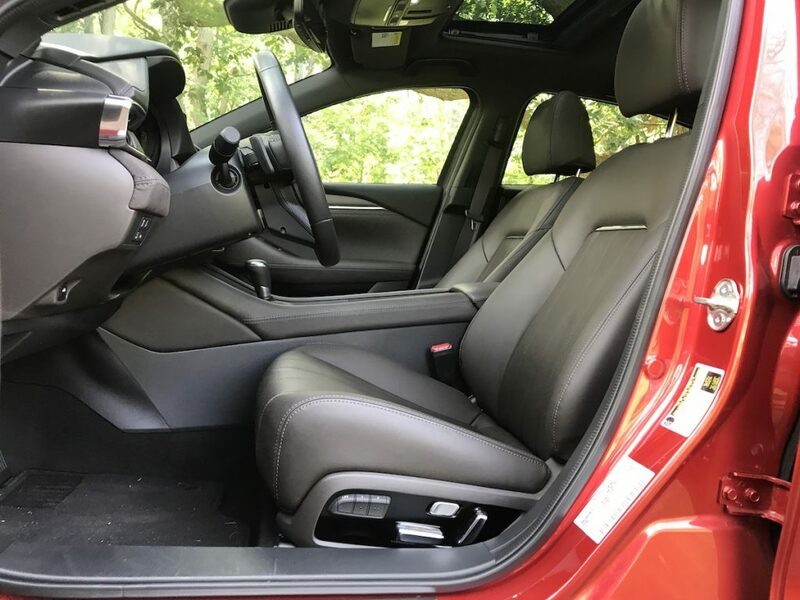 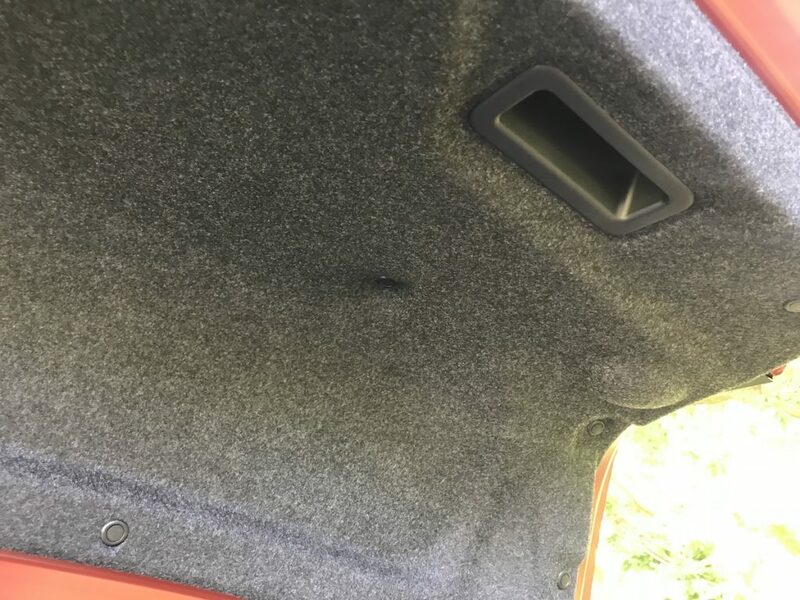 The seats are all-new and incredibly comfortable, with very strong cooling fans now built into the front seats to make summer weather much more comfortable. 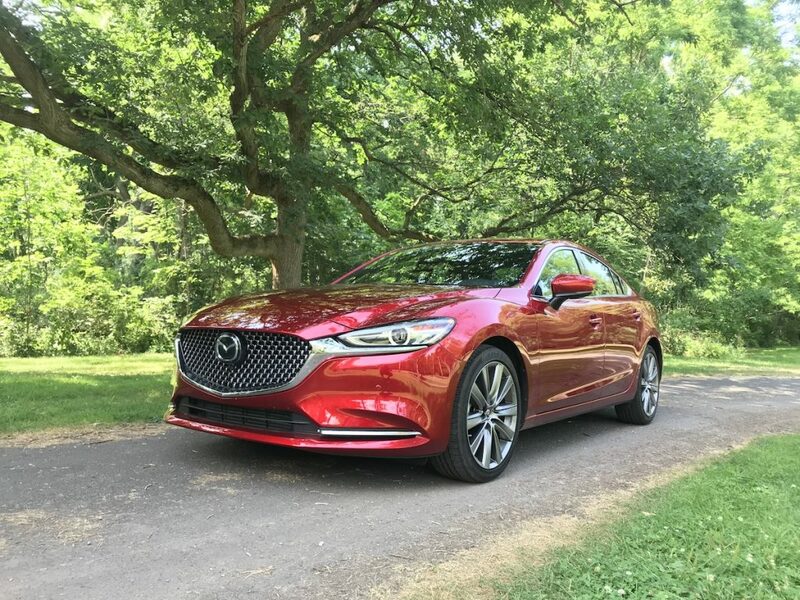 From a power perspective, the 2018 Mazda6 SKYACTIV-G 2.5T engine generates a robust 310 lb-ft of torque at an early 2,000 RPM and 250 horsepower. 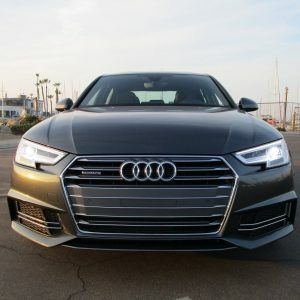 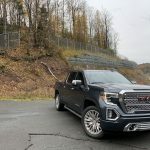 Power comes on instantaneously, courtesy of a Dynamic Pressure Turbocharger, which uses a small valve to create high boost pressure, akin to holding your thumb over the end of a garden hose. 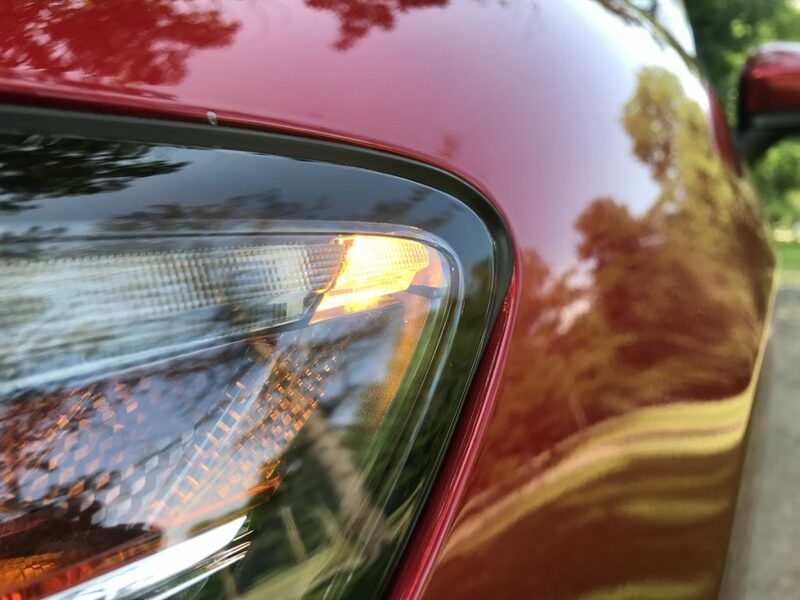 Once the engine is up to speed, a secondary valve opens up to allow more airflow through the turbocharger. 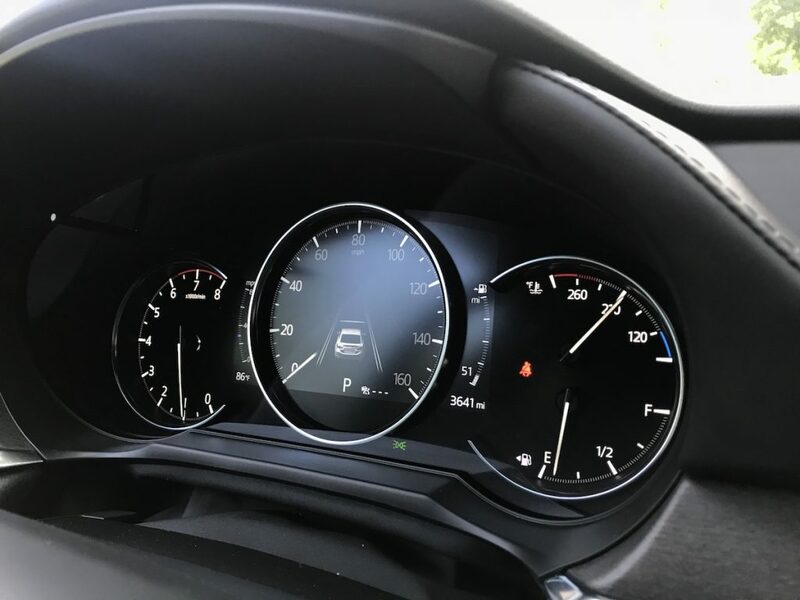 The engine has the feel of a V6, from a power and NVH perspective, which increases confidence and comfort as part of the driving experience. 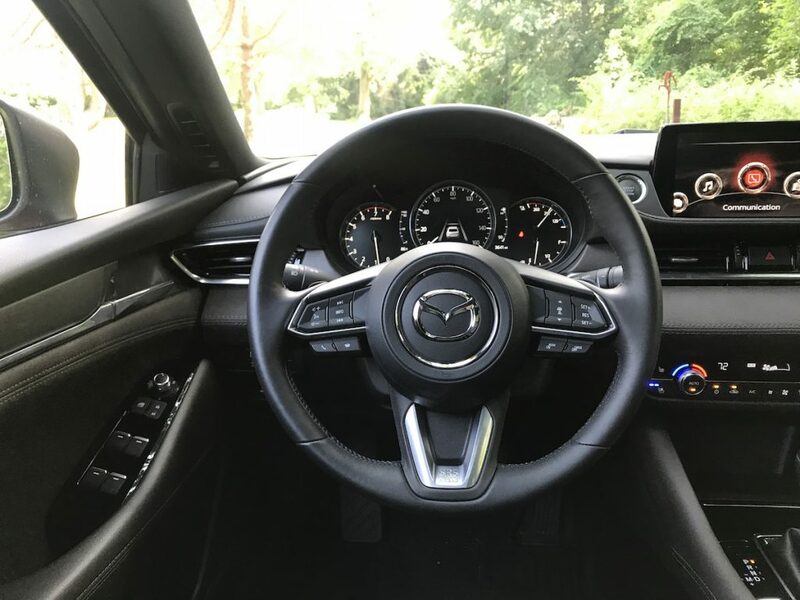 The steering feel is spot-on. 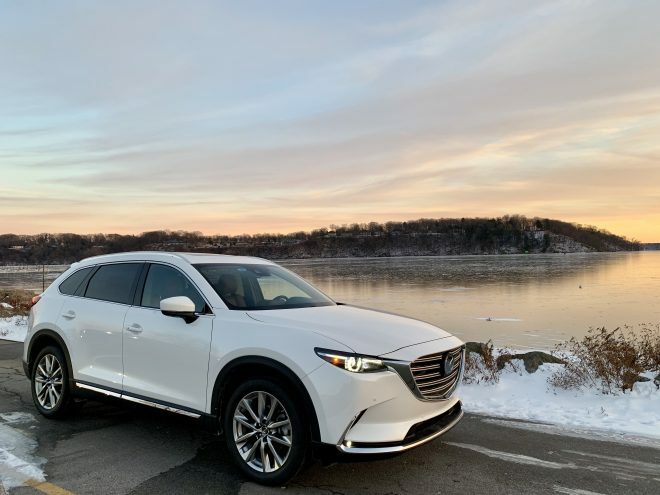 The ride is sumptuous, luxurious, sporty, and inspiring all at once. 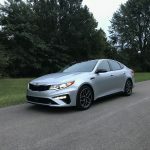 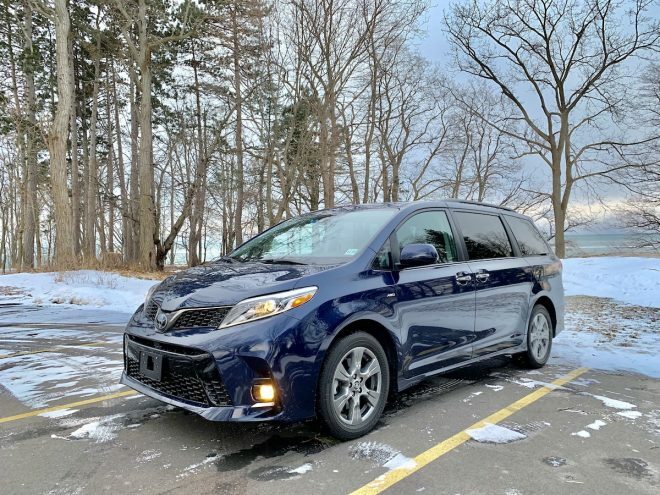 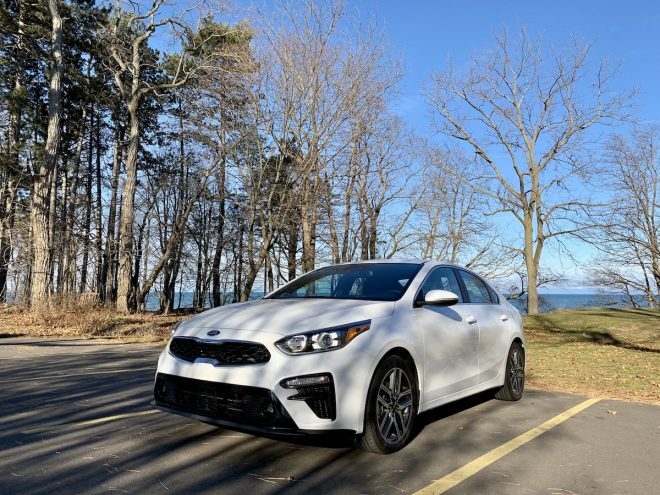 This is easily the best riding car in the segment, marrying dynamic handling with the right balance of comfort that everyone inside can appreciate. 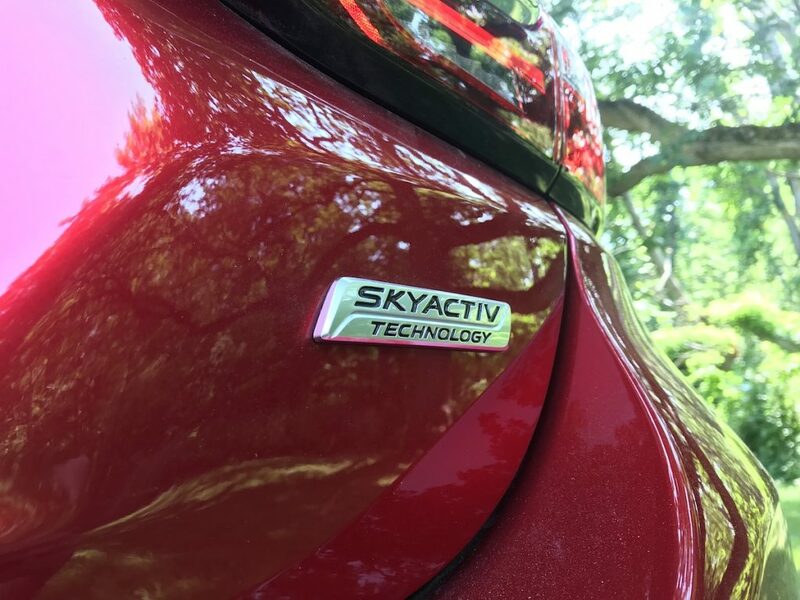 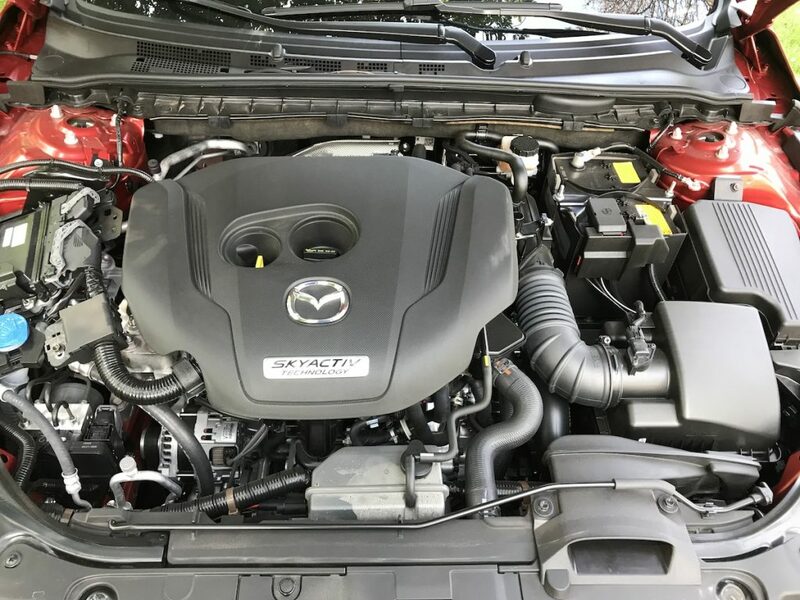 The engine is rated 21 mpg city, 31 mpg highway, but thanks to the innovative engineers at Mazda, we were able to achieve 33 mpg after a week of mixed driving. 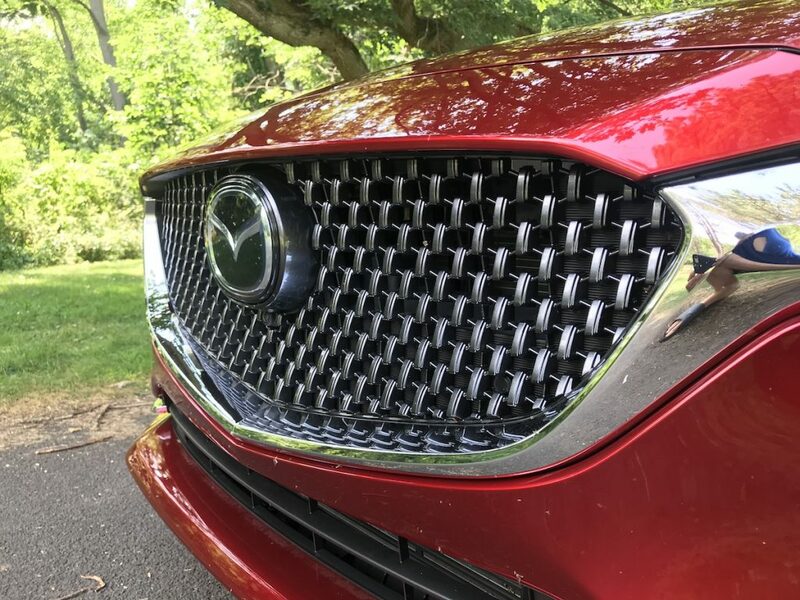 That’s amazing, and Mazda didn’t give up one ounce of driving enjoyment for that incredible efficiency. 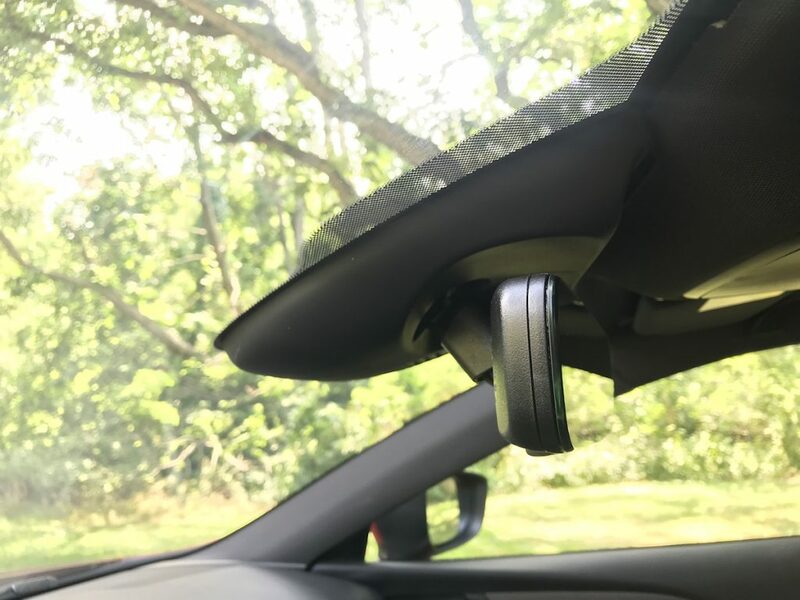 And last but not least, safety. 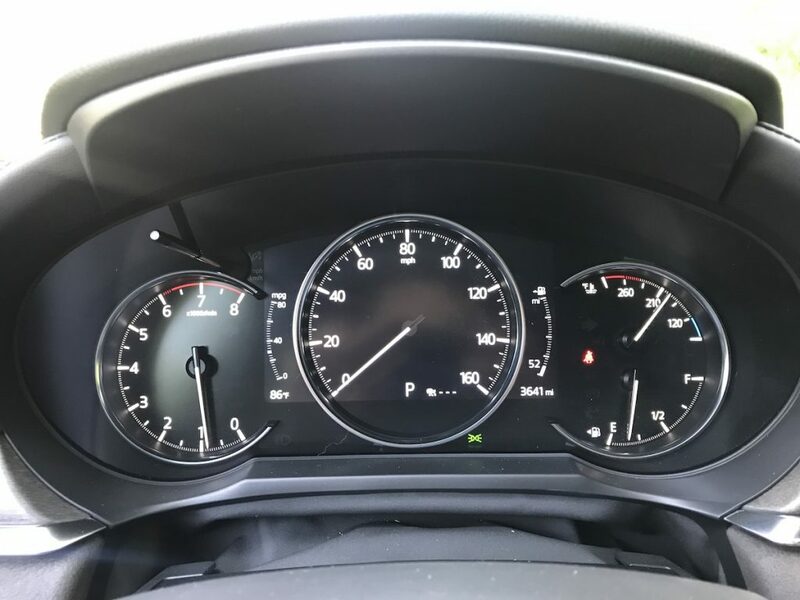 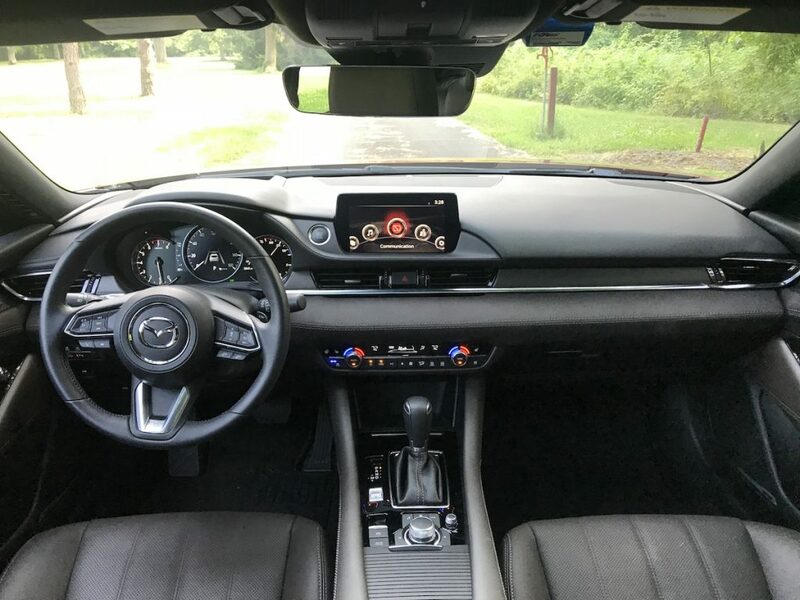 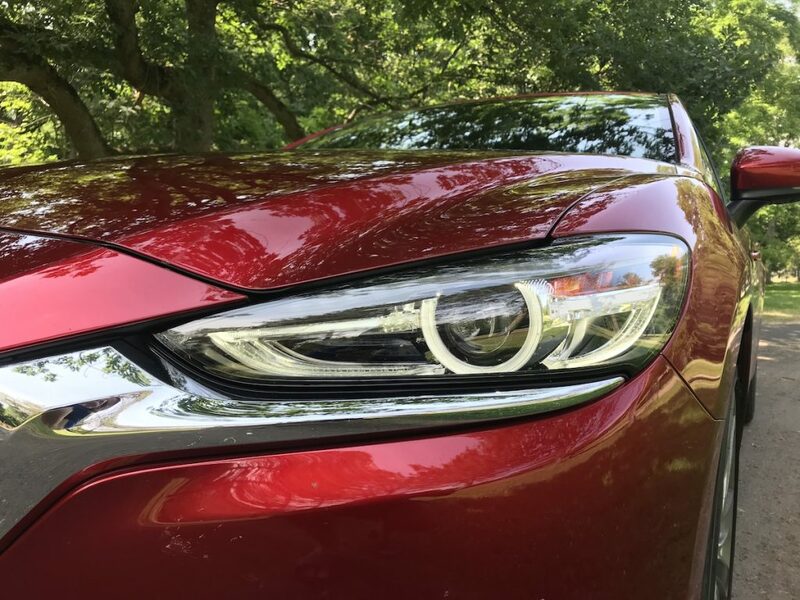 The Mazda6 impresses with all the latest safety technologies including radar cruise control with stop-and-go functionality, lane-keeping assist, auto emergency braking, traffic sign recognition, and an active driving display that projects a myriad of info onto the windshield in front of the driver. 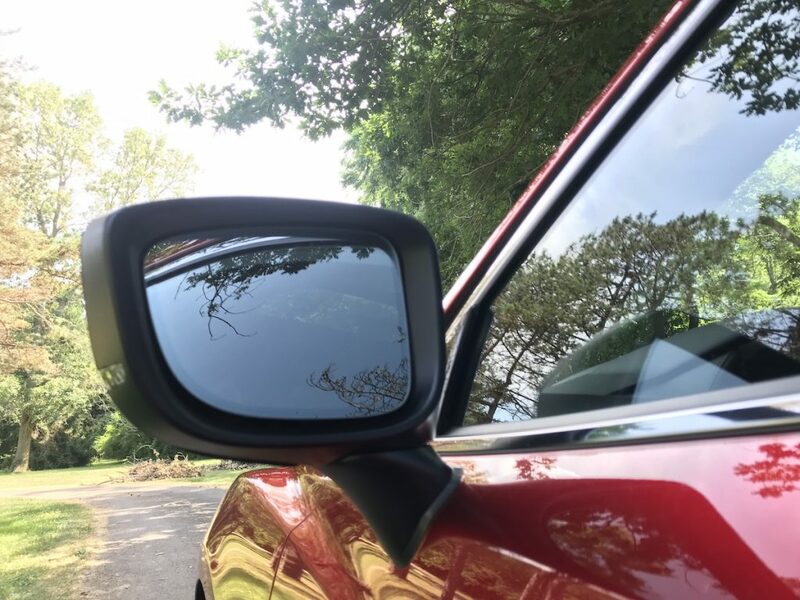 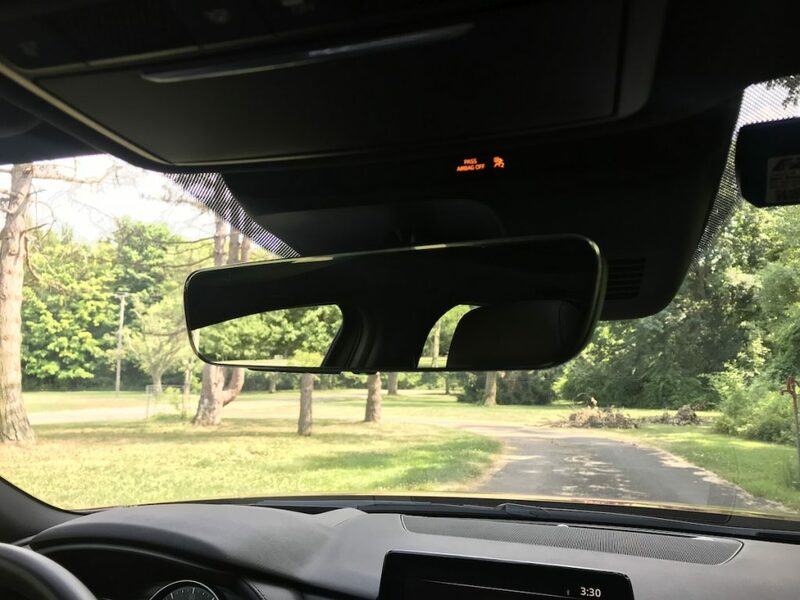 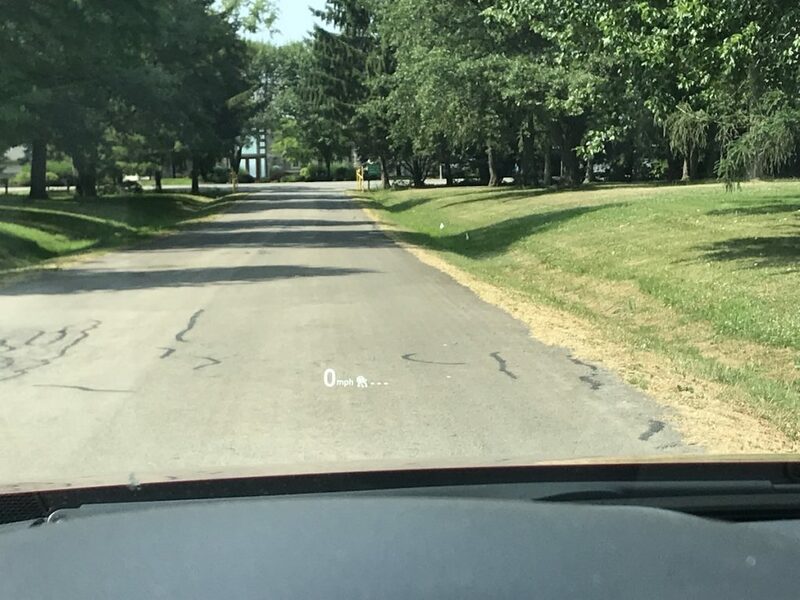 We especially like Mazda integrating the Blind Spot Monitoring alerts into the driving display, allowing the driver to know if there’s a car in their blindspot without having to look into the side mirror. 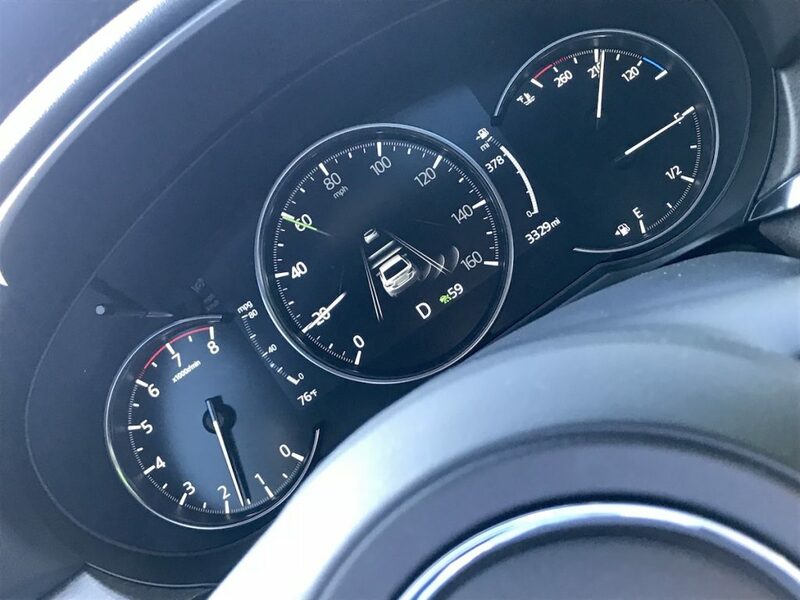 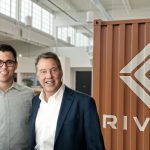 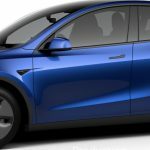 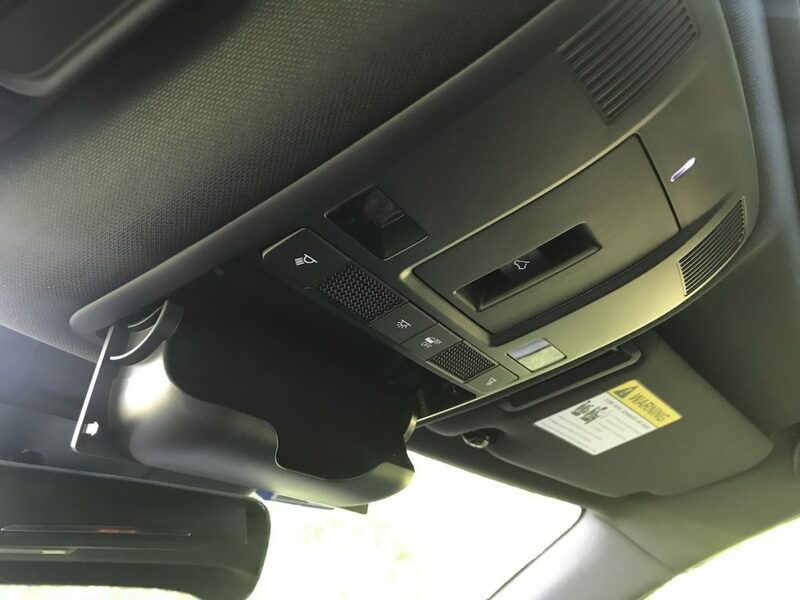 The radar cruise worked perfectly in stop-and-go commuter traffic, and we appreciate the ability to change the lane departure alerts to steering wheel vibrations instead of beeps. 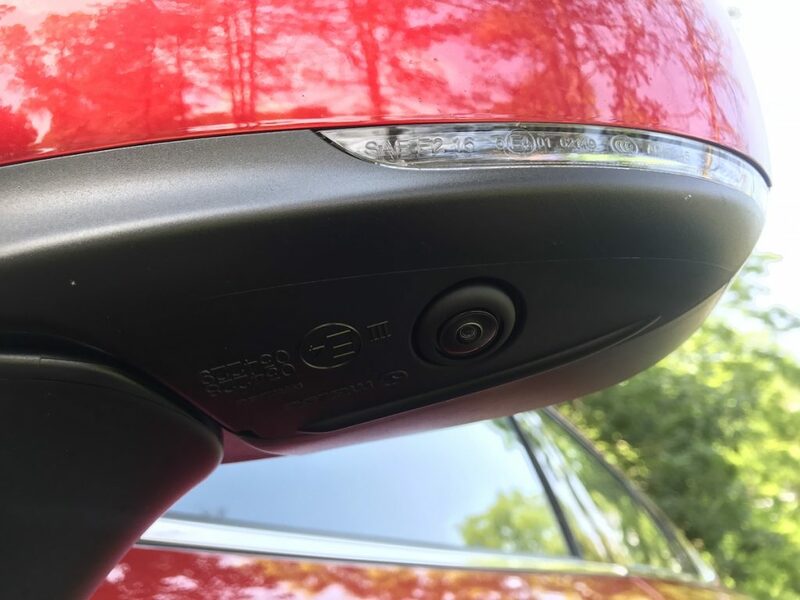 Parking sensors are also now in the front and rear bumpers, and work in tandem with the 360-degree camera system to make parking a cinch.